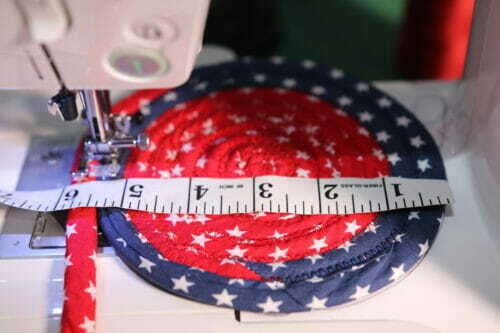 I have been invited to a 4th of July charity barbecue but unfortunately, I can't attend because I will be fabric hunting…..More on that later. The barbecue is organized by a friend of mine who operates a foundation, and this year the funds are being raised to help children of broken families with good grades to finish high school. I was asked to bring an item for the auction, specifically a table mat, not too big not too small. The invitation sat on my Facebook messages for 2 weeks and I just read it 24 hours ago. I panicked! Even if I can't go, I know my friend will expect the table mat. After all, it is a good cause. Looking in my sewing room, I spotted a roll of nylon cord next in my leftover fabric basket. There's not much fabric left in the basket, but there's a lot of cord. I thought a little bit about what I could do with what I had and I came up with an idea. I have two different colors of American star-themed fabric, so I can alternate the fabric to make a pleasing, contrasting effect. 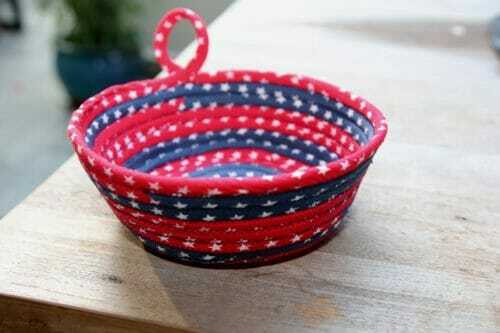 The BBQ's theme is “Americana” and I thought this was the perfect opportunity to launch a once-in-a-month item. 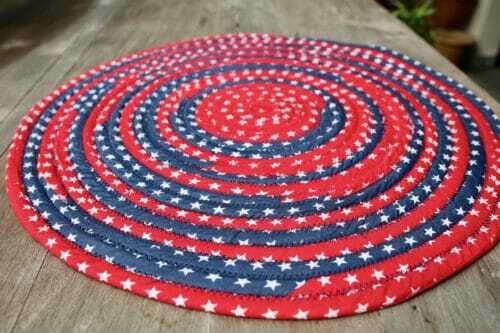 So for this project, I will be showing you how to make a corded table mat which I'll call the Star Spangled Table Mat. 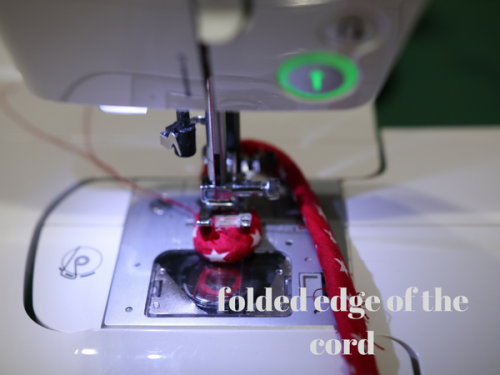 The cord that we'll use is encased in a bias tape so that there will be no raw edges. In the future, I would greatly appreciate if you guys could send me some project ideas for this Americana theme. As well as ideas for future themed series. I can see you asking why 26 yards? Is the smoke of the barbecue already getting to her? No, not really. I have a lot of cord. Left over from the Fringed Mat, I had fun with that project and because I did not know how much cord I would use at the time, I bought a lot! Then I bought even more for making the Hoodie. So you see, I have a lot to go through. Cut 26 yards of cord from the roll and fold in half. 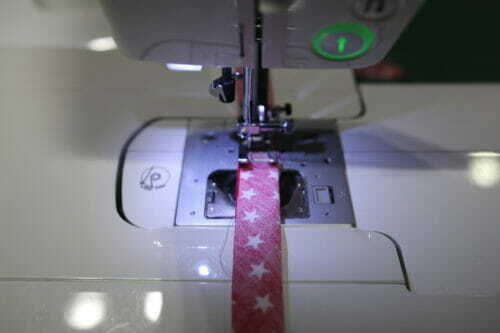 Change your machine to a Jeans needle and using a large zigzag, start zigzagging the cord to create a tape with it. Once you get to the end cut 2″ off on one side and only. This is so we can make the rope narrower at the end when is time to finish the table mat. Now let's work on the bias tape. We are talking about 13 yards of bias tape. A continuous bias tutorial is already written so once you learn this trick, threading the tape will be the longest part of the making this super easy table mat. As I mentioned, I used contrasting colors so when using the technique in the tutorial, I used one triangle of red and one triangle of blue which made a tape of alternating colors. 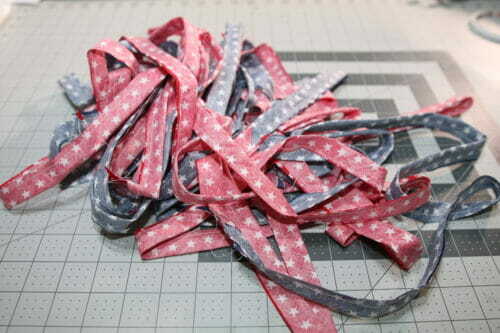 Cut strips of bias 1 1/2″ wide. 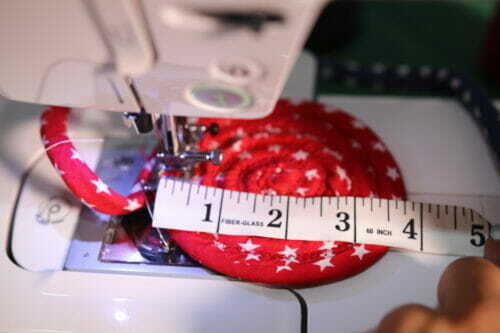 Sew at 1/2″ seam allowance right sides together. 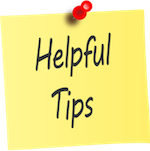 If you are using a thicker cord, remember to leave 1/8″ for ease so the cord can pass through the bias casing easily. 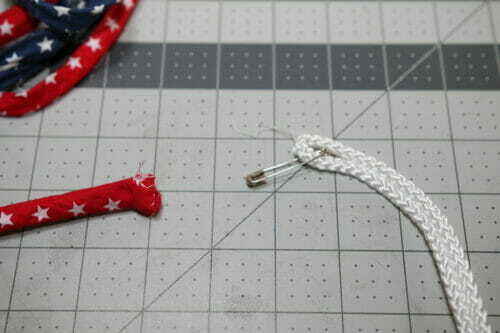 To turn the bias tape use a large safety pin. Grab a good movie and start turning, this will take an hour. Use the same safety pin to feed the cord into the casing. 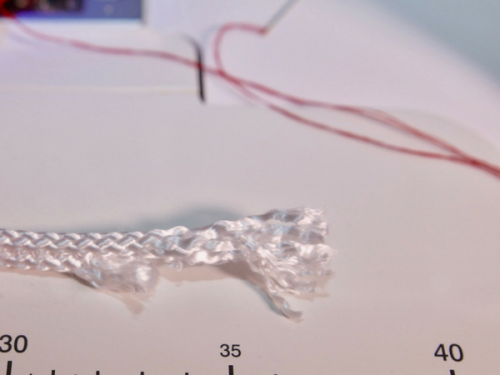 Inserting a pen before the pin will make feeding the cord easier and faster. 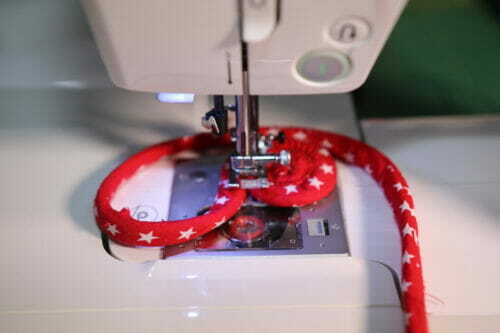 Once you have threaded the cord inside the casing, it's time to start to sew the mat. Use a needle and thread to close the casing on the pin side. 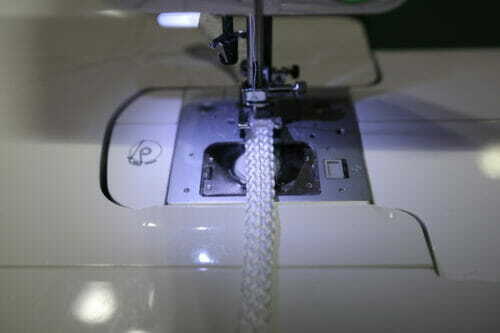 Fold in the beginning of the cord making a small circle and using your zigzag sew in between the cords. Start sewing counter-clockwise, not like me, I found after the mat reached 10″, I had to flip it over and sew in the other direction. Sew slowly so you do not miss any spots. 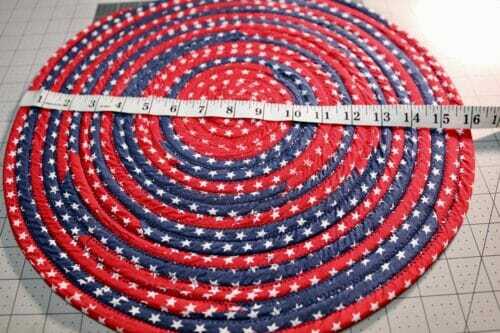 With one yard sewn so far, this is the size of the corded table mat. 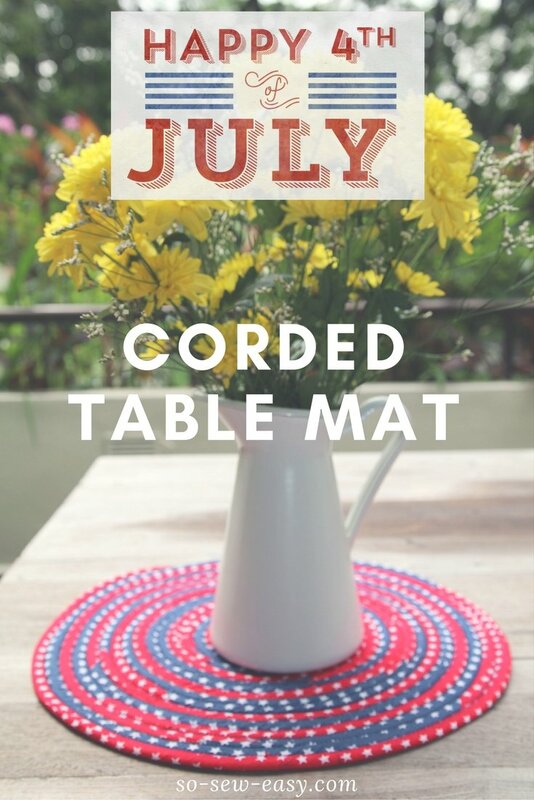 The following pictures will show you the mat in different size and the amount used so you can choose how much fabric and cord you need to make a set of plate mats. The size of the table mat is big enough for a coaster at two yards. It looks like a mug rug at three yards. At four yards. At five yards. 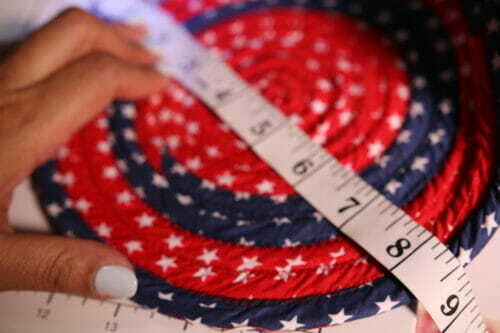 This is perfect for a plate using six yards. At seven yards it's still good for a plate if you wanted to show the mat around the edges. Here is where I had to flip my mat upside down because I ran out of space on the right side of the machine. The good news is no one will be able to tell I am sewing on the other side of the mat. I think at this point is big enough for a plate, but I am going further and make a centerpiece. Using a total of 14 yards of bias tape I made a 16″ mat and I love it. I will make a few coasters to go with it and maybe a bowl which I'll show you next week. At the end of the mat, make sure you end with the same color of fabric and not like mine. I am well aware I have to refine this ending, but perhaps you guys can suggest a better way of doing it. I simply sewed the end shut and zigzag the two sides together as close as I could. Now I'm off to make a few coasters to go along with this project. Thanks for reading! Just in case you didn't see it before, we recently finished the Easy Pleated Skirt sew-along, check it out if you're interested! The way you looped the handle for the bowl made me think that you could do Irish knots for St. Patrick’s Day as trivets maybe…very cute. I might have to go buy myself 26 yards of cord. They look amazing, so summerish! The end result is impressive, it looks great! Could be done with different holiday fabrics for any holiday celebration, such as Valentine, Easter, Halloween, Thanksgiving, Christmas. If this is to be auctioned off for fundraising, maybe you could make a set for holidays. I always need a project to do by hand so I don’t feel guilty watching TV. Turning the bias fits the bill. LOL! i feel the same way! You could still do this with the wrapping technique. 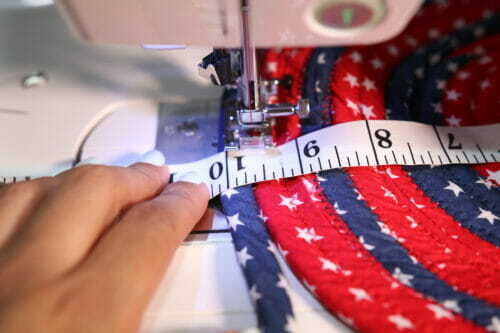 IF the fabric is cut on the bias, you will not have any fraying on the raw edges except where there are seams. Bias does not thread like cross grain or straight grain cuts. True but I would use so much more fabric. won’t I? Very nice. Not to difficult and very attractive on the table or sideboard. I like this idea. Couldn’t you get the cord into the bias tape by feeding it through as you turn it? I have seen this done before. Yes you could, but to be able to sew it in my machine it most be soft cord not stiff. My machine couldn’t zig zag thick cord at all. Thank you soooo much! This project is useful and very well explained! Since I need to buy cording, I’ll buy cotton cord (more absorbent) and 1/2″ wide to eliminate stitching together 2 pieces of 1/4″ cord. I commend you on using what’s in your stash!! Your ending tail could be more flattened if you leave about an inch of fabric..with no cording in it. 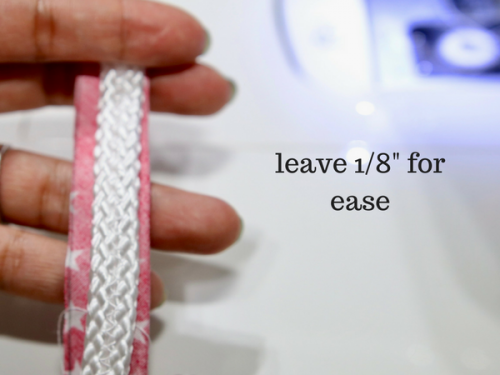 The taper begins when cutting off the cording on one side. It will gently end with just fabric. Thank you Freda, I will give it a try, let you know how I did on the next one. Cute table mat! You said you were looking for other Americana ideas. A few years back I made a garland to hang across the entry to my hall. I use a star shaped cookie cutter to trace several stars on some old denim jeans. I layered that with cotton batting and put a burgandy gingham on the back. I then stitched over the traced line through all 3 layers with burgandy thread. 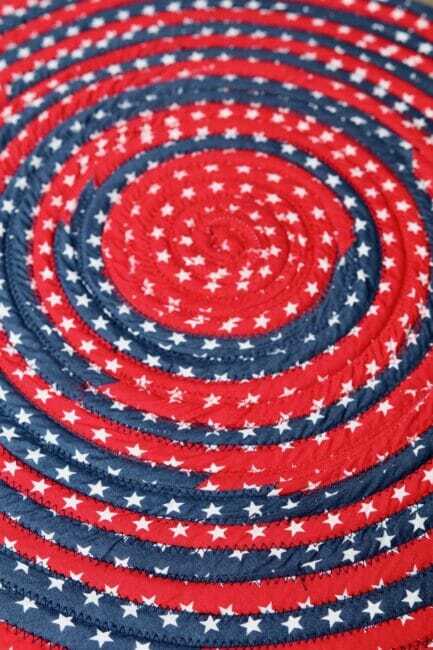 I then cut the stars out with pinking sheers leaving about 1/4″ outside the stitching line. I then tacked the stars together at the points (flipping some over so that the gingham shows) and then put ribbon on both ends to attach to the hooks on the wall. I think it turned out really cute. If you email me, I can email a picture back. Hi Marilyn, it sounds like a really fun and easy project. I tell you what if you make the project and take picture of the steps, it will be published with your name on it. What do you say? fell like becoming a contributor? I am always looking for people to share their ideas. I will email you anyways! This could easily be made with fabric pieces that you just wrap around the cord and sew the same way. Using pieces is a good way to use up scraps. And we all have scraps. THANK YOU for showing us how to do this. 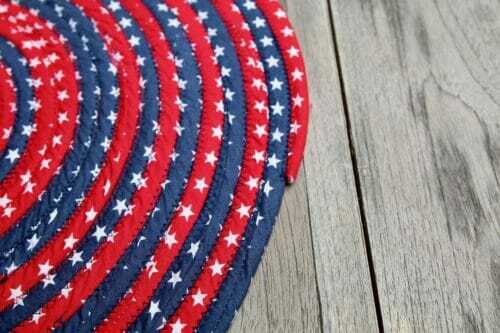 I am going to make a set before the 4th! I love this, and I am making one for my sister’s birthday. Thanks! This is so neat (and neat). I learned to do this by wrapping the cord, so raw edges were exposed. I still like it but yours looks so much neater! Can’t waiT for bowl instructions! The pen idea was great!